Why is Microsoft listed as the publisher for this Stardock application? Microsoft is just a small subsidiary of the Stardock Corporation. [e digicons]:rofl:[/e] You made my day, Boxxi!!! BoXXi is shifting guilt again. We know who's behind it all, Mr. BoXXi. Is he the guy what walked away from MS with a few million bucks in his pocket laughing all the way to the bank thinking......now you got # 8. Have a nice day? I hate to be the one to point this out, but this IS a support thread guys. Just sayin'. Rules is rules. Actually, this was posted in the wrong Forum since the question posed doesn't require Support per se and the poster didn't pose a problem needing a solution. Agreed, and I, and others I won't name, have gotten reprimanded by Jafo for posting fun in a support thread that was mislocated. Just saying, rules is rules. It IS in a support forum, even if by mistake. Come on guys, let's not confuse things here. the poster didn't pose a problem needing a solution. The poster did ask a legitimate question, support related or not. 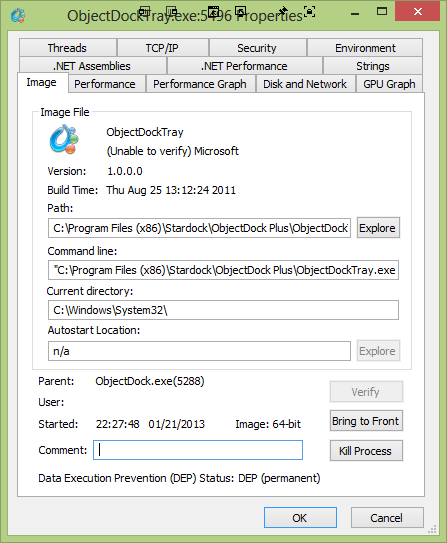 Arranging processes by Company Name in Process Explorer, I was looking to terminate non-critical programs to free system resources--and here we are... uncovering the genesis of truth behind any conspiracy and mythologies surrounding Stardock or Microsoft. Immediately after starting this thread I realized that the post most likely belongs in another area. SORRY! My first guess: this may have occurred at the operating system level or within the IDE of a computer that ObjectDockTray.exe was compiled on. I have witnessed Microsoft based products (e.g. Visual Studio or Windows) with "Microsoft" as the default word within the "company name" or "user name" text fields during their initial installation. That is what THEY want US to believe. Much ado about nothing . . The sample project skeleton version resources weren't replaced. I'll update them for a future update.